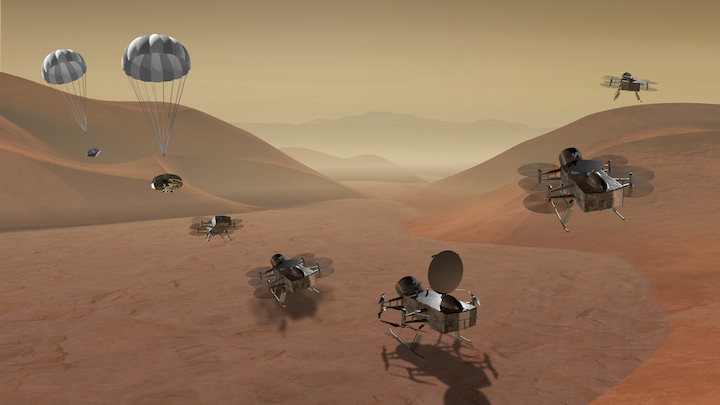 NASA has selected two finalist concepts for a robotic mission planned to launch in the mid-2020s: a comet sample return mission and a drone-like rotorcraft that would explore potential landing sites on Saturn’s largest moon, Titan. The agency announced the concepts Wednesday, following an extensive and competitive peer review process. The concepts were chosen from 12 proposals submitted in April under a New Frontiers program announcement of opportunity. The CAESAR (Comet Astrobiology Exploration SAmple Return) mission will acquire a sample from the nucleus of comet Churyumov-Gerasimenko, returning it safely to Earth. Comets are made up of materials from ancient stars, interstellar clouds, and the birth of our solar system. The CAESAR sample will reveal how these materials contributed to the early Earth, including the origins of the Earth's oceans, and of life. The CAESAR mission seeks to return a sample from 67P/Churyumov-Gerasimenko, a comet that was successfully explored by the European Space Agency’s Rosettaspacecraft, to determine its origin and history. Led by Steve Squyres of Cornell University in Ithaca, New York, CAESAR would be managed by NASA’s Goddard Space Flight Center in Greenbelt, Maryland. Dragonfly is a dual-quadcopter lander that would take advantage of the environment on Titan to fly to multiple locations, some hundreds of miles apart, to sample materials and determine surface composition to investigate Titan's organic chemistry and habitability, monitor atmospheric and surface conditions, image landforms to investigate geological processes, and perform seismic studies. Dragonfly is a drone-like rotorcraft that would explore the prebiotic chemistry and habitability of dozens of sites on Saturn’s moon Titan, an ocean world in our solar system. Elizabeth Turtle from the Johns Hopkins University Applied Physics Laboratory (APL) in Laurel, Maryland, is the lead investigator, with APL providing project management. The CAESAR and Dragonfly missions will receive funding through the end of 2018 to further develop and mature their concepts. NASA plans to select one of these investigations in the spring of 2019 to continue on to subsequent mission phases. The selected mission will be the fourth in NASA’s New Frontiers portfolio, a series of principal investigator-led planetary science investigations that fall under a development cost cap of approximately $850 million. Its predecessors are the New Horizons mission to Pluto and a Kuiper Belt object known as 2014 MU69, the Juno mission to Jupiter, and OSIRIS-REx, which will rendezvous with and return a sample of the asteroid Bennu. NASA also announced the selection of two mission concepts that will receive technology development funds to prepare them for future mission competitions. The ELSAH mission concept will receive funds to develop cost-effective techniques that limit spacecraft contamination and thereby enable life detection measurements on cost-capped missions. The principal investigator is Chris McKay of NASA’s Ames Research Center in California’s Silicon Valley, and the managing NASA center is Goddard. Led by Lori Glaze at Goddard, the VICI mission concept will further develop the Venus Element and Mineralogy Camera to operate under the harsh conditions on Venus. The instrument uses lasers on a lander to measure the mineralogy and elemental composition of rocks on the surface of Venus. The call for concepts was limited to six mission themes: comet surface sample return, lunar south pole-Aitken Basin sample return, ocean worlds (Titan and/or Enceladus), Saturn probe, Trojan asteroid tour and rendezvous, and Venus in situ explorer. New Frontiers Program investigations address NASA’s planetary science objectives as described in the 2014 NASA Strategic Plan and the 2014 NASA Science Plan. The program is managed by the Planetary Missions Program Office at NASA’s Marshall Space Flight Center in Huntsville, Alabama, for the agency’s Planetary Science Division in Washington.